It’s another perfect example of the non-falsifiability and complete flexibility of climate alarmism, which works like this: whenever there’s a local weather pattern—winter snowstorms (after being told 10 years ago that England would never see them again, for example), or cool summers—that runs against the global warming narrative, it is dismissed as “weather,” while any extreme local events such as tornadoes, hot weather, or drought are always called incontrovertible evidence that Global Warming Climate Change Is Happening! 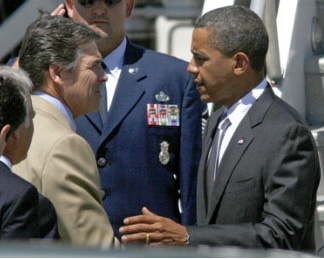 The indispensible Marc Morano’s ClimateDepot website delivers Obama’s well-deserved smackdown for this howler. Drought has actually been falling over the last century. 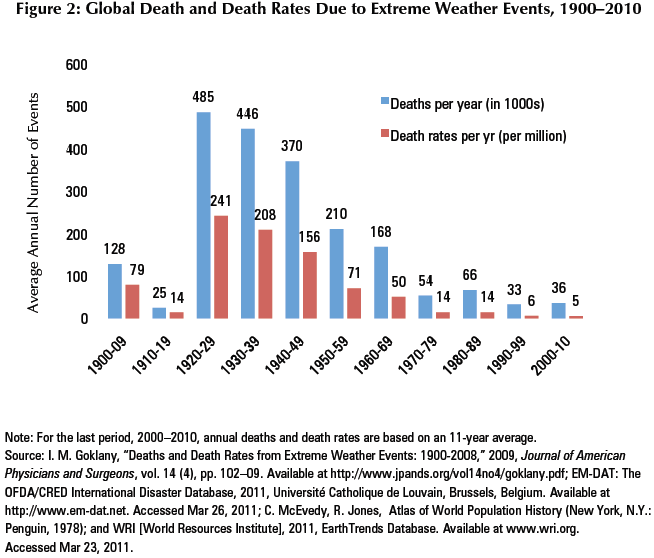 And deaths from extreme weather events have been steadily declining, too, as you can see on this chart of the data done up by my friend Indur Goklany (who is, it turns out, a government scientist!). Meanwhile, Morano gives a hat tip to Obama on one thing: in 2008 Obama said that his election would be “the moment when the rise of the oceans began to slow,” and guess what? The latest satellite data from both NASA and European scientific monitors show average sea levels have actually declined the last couple of years. A campaign promise fulfilled! At least one anyway. Hope and change have come to the world’s mollusks! But never forget the narrative: it’s Republicans who don’t pay attention to science. That never happens with liberals.